It’s been some years since I posted anything on this blog and a lot has happened in that time. Here’s a synopsis: Moved to New Zealand in 2010, lived there till 2016, loved absolutely every minute of it, moved back to the US in 2016. The loving absolutely every minute of it is probably why I haven’t posted anything in so long, I was having way too much fun! Anyway I’m back in the US now AND back in school. It’s time for another pivot in my life and career. If we only get one life I want to stuff as much into it as I can. 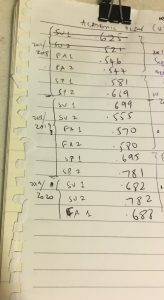 I’m studying at Boston University’s MET MSCIS program (Master of Science in Computer Information Systems) and doing the entire thing online. I have a strong sense of what direction I want to take with this, and I am currently aiming at a dual sub-concentration (Health Informatics and Data Analytics). The BU MET MSCIS program is accredited by the Commission on Accreditation for Health Informatics and Information Management Education (CAHIIM), certified by the Committee on National Security Systems (CNSS), and accredited by the Project Management Institute Global Accreditation Center for Project Management Education Programs (GAC). 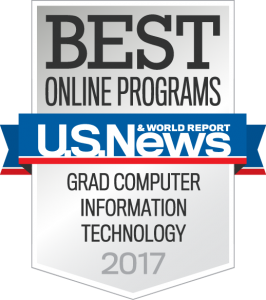 Additionally, this year, the MSCIS program at BU MET ranked #4 among the Best Online Graduate Computer Information Technology Programs (U.S. News & World Report). Not too shabby overall. I’ve just completed my second course and thought I should start putting down my thoughts on the program so far and on classes I’ve taken and am taking. This will be a series of posts as I go through the program, as a way for me to decompress and also maybe offer a helpful insider view for anyone looking to join this program or a similar one. So as I stated I have just completed two courses but I’ve actually completed three, the first was a prerequisite and doesn’t really count towards the degree requirements. The first thing I have to say is that the BU MET MSCIS online program is RIGOROUS, no questions about that. You have to be very focused, disciplined, and self directed to succeed at it. We have seven week terms with a one to two week break between terms. Each seven week term you take just one class, which may not sound too bad, but the course load is not trivial. Boston University prides itself on demanding the same rigor in its online 7 week classes as in the 14 week in person classes, and they follow through with that, which is why the program is so rigorous. Of the two classes I’ve taken so far we have a professor and a number of facilitators, each of whom is responsible for a group of students, usually about 15. All exams are proctored (via Examity), and some are open book and others closed book, depending on the course and the professor, and the classes so far have run fairly smoothly with faculty being very responsive and helpful. The main MSCIS program constitutes about 10 courses total, there are 5 core (required) courses and then another 5 which vary by sub-concentration. You don’t have to pick a sub-concentration, but you still have to do 10 total courses so you would pick 5 elective courses. But if you want to pick a sub-concentration your current options are: Computer Networks, Data Analytics, Database Management and Business Intelligence, Health Informatics, IT Project Management, and Security. Of course these might change by the time you’re reading this but they are correct as of the date on this post. You should check for up to date information on the official BU website. Because I have elected to do a dual sub-concentration, it will take me just over two years to finish the program but generally it should take just about 2 years, which isn’t too bad. I’m really excited about this program and the possibilities ahead. In future posts I will briefly talk about the classes I’ve taken so far and that I’m taking and my thoughts and advice for anyone going into the program or taking the same courses in the future. My first piece of advice though is if you go into this program, PLAN. Plan well in advance and have a clear course map of what classes you will take when. The reason I say this is that not all classes are offered every term, or every semester even, and because a lot of classes need you to have taken other classes first, it’s CRUCIAL that you sit down with pen and paper and map out your entire program, what you will take when. Fortunately BU releases a schedule of what classes will be offered when on its website way ahead of time (http://www.bu.edu/csmet/academic-programs/mscisonline/onlineschedule/), and so you can sit down, make a list of what classes you need to take, arrange them in order of what their prerequisite classes are, and then go through the schedule to find what is being offered when. Then make your schedule. For example, here is what my current plan looks like, roughly. Sounds exciting and I will definitely be checking in on your progress. Good luck! Hi Mary loved the information regarding the program. I just started the MS CIS online as well. Was curious if you knew of any websites or additional material that you found helpful for CS 200. Any tips would be greatly appreciated. Hi Rob, thanks for your comment. I’m glad you’ve found this post helpful, I’m just gearing up to write the next one in the series! For my prereq I did CS 300 which is Foundations of Modern Computing (description here). We used Python, and I think 200 uses Java? There are some similarities so here’s what I’d advice. Depending on what part of the course you’re struggling with there are various resources out there in addition to the lecture notes. For the math stuff a lot of my classmates said Khan Academy helped. For the computing stuff YouTube and StackOverflow were super helpful for me. Additionally, the BU class facilitators are a lifeline! Just don’t wait till you’re struggling, reach out early with questions and they’ll help you through. If there’s anything specific I can help with please feel free to ask, and I’ll help if I can. Just pop a comment here. All the best! I’m loving the program so far and I hope you will too!